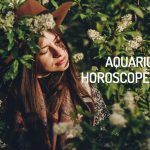 Looking for the Aquarius Horoscope for 2019? Every month, you will find here the astrological forecasts for your zodiac sign. Check the Horoscope for Aquarius, in 2019. The influence of the stars will make the natives of Aquarius more romantic and give them a desire to enjoy intimacy during January, but there may also be outbursts of jealousy. Both single Aquarians and those in committed relationships will be more social. The Aquarians will be more attractive in March and will attract the attention of others. Those who have partners will be enjoyable and creative. At work, there will be an in increase in socializing and forming strategic alliances with business partners. Expect a good administration of finances in February. It will be a good time to invest and take risks, but good preliminary analyses and guidance from trustworthy people are necessary. There will be a special focus on your physical wellbeing and the improvement of your health, thanks to the influence of Uranus. With good physical and mental energy, it will be an ideal cycle to establish healthy habits. The vital energy is stable, but emotionally you could become very attached to people or beliefs. Aquarians will feel the need to know more about their partner and themselves during the second trimester. Single people will start a very vivid romance and those who are in a relationship will enjoy their marital life. Some couples will plan a new direction for their relationship. April will be an auspicious month for studying and expanding the visibility of a company or projects, especially by using the Internet. Aquarians will realize that they should organize their work and finances better, setting priorities and getting everything related to these topics in order. The ideas of the Aquarians will stand out at work; interpersonal relationships will support them. With respect to health, these natives of the sign will be more responsible with their body, eating habits, physical development and emotional commitments among others. Beware of melancholic moods and low self-esteem. Look for support in the form of affection. You will need to rest and sleep well to recharge your batteries in June. Love in the third trimester will be defined by complications in communicating with your partner. The couple’s friends will help them to overcome obstacles and rediscover each other and their bond. Younger couples will grow in confidence and older couples will improve their communication. Communication will also be affected with business partners at the beginning of the third quarter, but there will be good energy for the development of independent projects. You will feel a certain passiveness at work and in business with others; you will have to participate and get more involved. The people who have international businesses will have very good astral support. It is a good time for publications and advertising. In July, Aquarians will feel the need to recognize the limitations that hinder good communication in order to understand and overcome them. You will suffer from irritability and high tension in August, so it is a good idea to practice relaxation techniques more frequently. You will overcome some anxiety problems and face old fears or phobias. Pluto will have a positive effect emotionally in October, helping Aquarians overcome fears and express their feelings in a better way. Singles will have opportunities to start a relationship with people who are closer than they realize. The influence of Venus will fill the natives of Aquarius with charm which will benefit both singles and those already committed to someone. Work matters will take precedence for Aquarians, in need of recognition, in the fourth quarter. There will be some setbacks financially, but also a good outlook for long-term projects. Expect good annual synthesis in labor and economic matters, with possibilities of projections into the future and investors as well. October is a good month for regaining your energy, relaxing and doing recreational activities. In November, the children of the water carrier will feel stress from work and could suffer from headaches. In December, there will be a break from the mental tension thanks to Chiron in the House III of Aquarius granting a period for reconciliation and making peace. The presence of the asteroid Eros in the V House of Aquarius indicates the pleasure of romantic adventures and the enjoying intimacy as a couple. But be careful because this planetary position can lead to passionate outbursts of jealousy. With Ceres in the X House of Aquarius until January 24th, the main focus will be in the workplace. Aquarians will spend time developing their public image and sharing and receiving experiences of success and entrepreneurship with other people. Uranus, the ruling planet of Aquarius, will begin its direct phase on January 6th, providing greater mental clarity to the sons and daughters of Aquarius, who will be immersed in planning short and medium term goals. Jupiter will continue in the XI House of Aquarius until December 2019, favoring the unconditional support of friends, and greater activity in your social life. The entrance of Vesta into the II House of Aquarius (02/01), will allow for efficient management of physical resources, which is critical during this period of the year, considering that Neptune will be in the same location. The New Moon in Aquarius on February 4th will be the perfect opportunity to invest in yourself again, both internally and externally. Do not waste it. Aquarians who are engaged will give greater relevance to the dynamics of their relationship thanks to the entry of Eros into the VII House of the sign (03/29). Additionally, this transit is characterized by the fact that it will provide the Aquarians with a lot of social appeal. The retrogradation of Mercury will take place in the II House of Aquarius from March 5th to March 27th, which can be interpreted as difficulty in choosing between different options for investment. It is recommended that you do not take any risks and analyze information in detail before making a decision. Uranus, the ruling planet of Aquarius, will pass into the IV House of the sign on March 6th. Although this transit increases physical strength, you may become attached to things and develop the tendency to cling (stubbornly) to your beliefs. The presence of the asteroid Psyche in Aquarius benefits the practice of getting to know yourself, especially the work of your conscience to accept your own vulnerability. The New Moon in Aries on April 5th will affect the III House of Aquarius, which signals that it is a favorable period to take short trips or study something for a short period, launch a website, or venture into the world of social networks (developing your online profiles). The entrance of the asteroid Juno to the VI House of Aquarius (04/20) indicates a high level of commitment to all-round well-being, but this does not imply neglecting other aspects of your daily life (home, work, family). The entry of Mercury and the Sun into the V House of Aquarius during the second half of May multiplies your joie de vivre and the possibility of finding a new romantic interest. On May 30th, the direct phase of Pallas in the IX House of Aquarius will begin. This is a planetary movement that you should take advantage of in order to organize documents related to work or living visas, publications and registering for studies at universities or academic centers. The entrance of Lilith into the II House of Aquarius (05/03) can generate uncertainty in topics associated with self-esteem and self-worth. The arrival of Vesta to the IV House of Aquarius (06/09) is a favorable transit for Aquarians who are in the process of building their own house. On the other hand, those who already have their own house or are leasing one will channel as an act of devotion. The entry of the Sun into the VI House of Aquarius (06/21) presents the opportunity to stand out in the workplace by promoting your ideas and supporting your coworkers. Although the retrogradation of Saturn and Pluto in the XII House of Aquarius will alter the sleeping habits of the sons and daughters of the water carrier; the entrance of the Sun to the VI House of the sign will allow them to recharge their batteries and overcome any setbacks successfully. Part of the retrogradation of Mercury will take place in the VII House of Aquarius (specifically in the period from July 7th to July 18th), which can hinder communication in couples and the closure of business deals. On July 17th, Ceres will begin its direct phase in the XI House of Aquarius, where Jupiter is in retrograde; nevertheless, this transit will increase your closeness to work groups that allow you to contribute to humanitarian initiatives or to leverage personal projects. The beginning of the retrogradation of Chiron in the III House of Aquarius, starting on July 8th, implies a period of reflection on the value of ideas and the ways you communicate on a daily basis. On August 11, the direct phase of Jupiter begins in the XI House of Aquarius, reactivating the social life of the sons and daughters of the water carrier. During the second fortnight of the month of August, a stellium (accumulation of planets) will form in House VIII of Aquarius. This stellar event means that you must assume a more active participation in the business you share with third parties (family, partner, partner). The state of mind of the natives of Aquarius will be affected by the retrogradation of Uranus in House IV of the sign (11/08), since it will create tensions and clashes within the home. During the first half of September, the alignments are ideal for working on trust in personal relationships. The passage of several planets over the IX House of Libra indicates that September will be a positive period for the negotiation of international agreements, learning other languages ​​and launching publications or websites. With the beginning of the direct phase of Saturn in the XII House of Aquarius (09/18), you can bid farewell to the ghosts of the past, overcome your anxiety and focus on the blessings of the present. Pluto will culminate its retrograde phase in the XI House of Aquarius on October 3rd, which can be interpreted as overcoming old fears that prevented the right signs of personal power. In the month of October, the Aquarians’ attention will be focused on how to project their professional character more, so that their initiatives and projects receive the recognition they deserve. With no planets in retrograde in the XII House of the water carrier, October is projected as a period where you can regain regular resting hours and devote time to relaxation. Romantic opportunities will arise with people close to your circle of friends. Do not refuse to participate in social events, which in addition to being fun can provide you with business opportunities. The direct phase of Neptune begins in the II House of Aquarius on November 27th, which, although making it difficult to adjust to a previously established budget, facilitates the visualization of economic objectives in the medium and long term. In general, the physical condition of the sons and daughters of Aquarius will have a positive balance in this period of the year. However, pressure in the workplace can generate episodes of stress and frequent migraines. The entrance of Venus into Aquarius on December 20th will enhance the charm of the natives of the sign. This transit is excellent if you want to present your ideas to a group or potential investors. The Full Moon of December 12th will impact the V House of Gemini, indicating the closure of a creative project or taking a step to the next level at work. The beginning of the direct phase of Chiron in the III House of Aquarius (12/12) decreases mental pressure and facilitates reconciliation with people in your immediate surroundings (siblings, neighbors). Recognition of some personal limitations. Possible ruptures and changes in the love life of Aquarius. New business areas will arouse your interest and you will have the financial stability you need to dare and risk. It is a time to recover from diseases and strengthen the system in its entirety. You will be less sensitive and more mental. You will feel more creative and lucid in managing your resources. Many Aquarians will want to take on more lasting commitments. Some delays in payments could affect your mood. At work you will be more willing to improve the organization as a hole. Try to avoid salt and sugar excess. Avoid unnecessary expenses and beware of possible scams or deceptions that may occur. Start doing some exercise to improve your physical condition. In the middle of the year you will have new professional challenges, which gives you notoriety at work but, at the same time, you will have to protect yourself from some bad energies that may come from your colleagues. You will feel more energetic but you must take care not to suffer injuries. In addition, you will have the tendency to gain weight, so you should check your diet and do a little more exercise. At the professional and personal level you will need to plan with more details of your projects and goals. Aquarians will start a period of more vitality, strength and fertility, at the same time; you will feel the need to cultivate your spirit as well. There is a constructive and reconstructive attitude in the loving bond, so it is important to reconcile past situations with the loved ones. The year ends in a fairly quiet environment in the family and with your better-half, but watch out for some people who want to meddle in your relationship. Control your temperament at work, avoid conflicts, seek to improve relationships and not to enlarge the problems. At the end of the year you will feel the need to find balance in the spiritual foundation of your vital activities. The total eclipse of the Full Moon in Leo (01/31), will touch the VII House of Aquarius, which can mean either a break-up in a relationship, which you know can not last any longer, or the recognition of a (negative) pattern that prevents love from being fully enjoyed. Your finances will remain stable during this period. In the work environment, it is a good time to project yourself professionally. New initiatives will attract your attention. Uranus, the ruling planet of Aquarius, will finish its retrogradation process in January. For people with this sign, this planetary movement indicates the beginning of covalence for those who faced diseases. However, it is essential not to overexert your body, because there is a possibility of experiencing problems with blood pressure or circulation. The partial solar eclipse, which will happen on 2/15, will take place on the sign of Aquarius, a position that implies directing the mental plane towards evolution and personal improvement, as the main objective. Several planets will be in transit over the II House of Aquarius, generating a (positive) boost in income and management of resources. Charitable or humanitarian activities will have great importance. Progressive physical improvement. Vitality is gaining ground. Lymphatic drainage massages are recommended. Decrease the consumption of foods with a high salt content. The asteroid Ceres will begin its direct phase in the VII House of Aquarius (03/18), impelling the natives of this sign to learn to work together as a couple, leaving aside the fear of losing their independence. The beginning of the retrogradation of Jupiter in the X House of Aquarius (03/08), indicates that you must be careful with the people you associate with, and not expose your public image in compromised situations. Strength. Stable physical state. Exercise caution with the possibility of suffering small injuries, in the area of ​​the ankles and feet. Harmony in the home. Healing contact with a mother figure. Change of residence or improvements to the place you live, will occupy your attention. With Jupiter retrograde in the X House of Aquarius, the tendency to procrastinate will be high, and although negotiating new deadlines will be possible, it may end up hurting you. Pluto and Saturn will begin their phase of retrogradation in the XII House of Aquarius, which will considerably alter the subconscious minds of the sons and daughters of the water carrier. Insomnia, and irregular sleep patterns (a lot or a little bit of sleepiness), will characterize this season. Uranus, the ruling planet of Aquarius, will enter the IV House of this sign, indicating an innovative character while fixing your home, but also a sense of disconnection with respect to your family of origin. The asteroid Palas will enter the VI House of Aquarius (05/21), preceding the entrance of Venus to the same sector of the astral map, which translates as a better disposition towards daily tasks, and significant improvements in all work-related systems. Physical strength Fertility. Concern about one’s own spirituality. The first half of June will be a positive period for love and romance. At the end of the month, couples will focus on working on the topic of intimacy and trust. Neptune will begin to retrograde in the II House of Aquarius, a planetary movement that can push the owners of this sign to make unnecessary expenses, or be a victim of the interests of third parties, involved in purchases. Physical strength and vitality. Good time to start a new exercise plan, with the supervision of qualified personnel. Chiron will be retrograding, starting on July 5, in the III House of Aquarius. The event indicates doubts linked to the effectiveness of your own mental process, and the tendency to consider the opinions of others as more valuable than your own. The partial eclipse of the Sun in Cancer, which will take place on July 13, will affect the VI House of Aquarius, which implies a new professional challenge, which will allow you to reach unexpected heights. With the eclipse of the Sun, which will happen on VI House of Aquarius, it is important to review your eating and exercise habits, with the assistance of professionals. Good time for annual medical check-up. During the month of August, your relationships] with your partner will go through certain tensions motivated by the retrogradation of Mercury and the eclipse of the Sun in Leo (08/11), both in the VII House of Aquarius. However, the disagreements will allow you to finalize past situations that muddy the present. Mars will retrograde in the XII House of Aquarius, starting on August 12, a planetary movement that alerts you to the action of hidden enemies, especially in the work area. Uranus, the ruling planet of Aquarius, will retrograde again. This situation involves the risk of minor injuries to the back or neck for children of the water carrier. The first half of September will give you time for introspection. Analysis of intimacy (as a couple) will have an emphasis, as well as how to heal destructive patterns that hinder coexistence. In the process of retrogradation, Chiron will enter the II House of Aquarius (09/25), activating issues related to the way you handle your relationship with money, awareness of merit and personal value. Although you feel satisfied by the development of events, it does not stop causing you to go through episodes of stress. Daily practice of relaxation exercises will be an effective tool for you. Juno, asteroid of commitment, will retrograde in the V House of Aquarius, starting on October 11, which indicates a certain grudge against your life partner, based on a supposed lack of support for your initiatives. The retrograde phase of Venus will begin on October 05, and will impact the X House of Aquarius, a planetary movement that implies paying more attention to appearances and not to substance, forgetting that preparation is crucial to achieve your goals, both in the professional world as well as the personal. If you are interested in esoteric subjects and holistic treatments, October will be a good season to receive alternative therapies, related to energy balance of chakras, and release of blockages created in previous existences. In the month of November, Jupiter and the Sun will enter the XI House of Aquarius, indicating that it is time to reconnect with friends and enjoy yourself. Interesting opportunities will emerge from these encounters. Neptune, planet of the deep, will begin its direct phase in the II House of Aquarius (11/24), generating improvements in finances. However, it is important that before making a meaningful purchase, request advice (impartial) or you could be disappointed. In November, the North Node will be activated in the VI House of Aquarius (11/15), so care of your body and spirit will come to the forefront, making you recognize its true value and the need to pay attention to it. On December 23, the asteroid Juno will enter its direct phase in the IV House of Aquarius, just in time for the Christmas festivities. This planetary position encourages the responsibility of guaranteeing a harmonious environment for your family. But be careful, it also points out some differences with the relatives of your partner. Mercury will be retrograding from 01 to 06 December, in the X House of Aquarius, during this period avoid aggressive attitudes in the workplace or you will be in serious trouble. Do not commit to causes that go against your personal values. The entrance of the asteroid Vesta to your sign (12/01), marks a growing desire to feel connected with your spiritual side (regardless of whether you are religious or not). Take the opportunity to work in harmony with the divine energy within.